I have a problem using an ESP8266 and a NRF24L01+ module. I followed all the steps from this guide https://forum.mysensors.org/topic/666/debug-faq-and-how-ask-for-help and still it won't work. 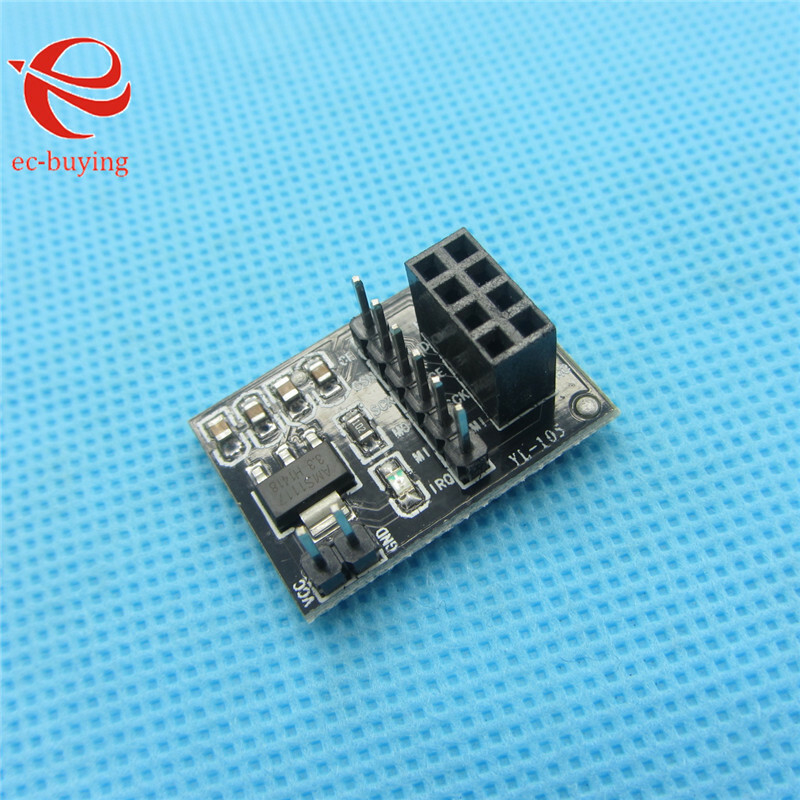 I am using an adapter like this https://www.aliexpress.com/item/5pcs-Socket-Adapter-Module-Board-for-NRF24L01-Wireless-Module/32368381876.html for converting the power and for power stability. I have two NRF24L01+ modules and I've tested them with an Arduino Nano which it works. I can't get it to work with ESP8266, I've checked the wirings multiple times. I've tried to power the module directly from ESP8266 and separately from a 5V PSU with the 5V regulator adapter and common ground with the ESP8266. You mean 3.3v adapter? The ESP is not compatible with 5v. This is the sketch that I'm using. The ESP8266 was running from my PC using a usb cable. I've tried to power the NRF24L01+ from the ESP8266 directly with dupont cable also I've tried through the Socket adapter plate board. I've tried to power the NRF24L01+ from a 5V power supply. The NRF24L01+ ground was common with the ESP8266 ground and the VCC on the adapter(which pass through the 5V to 3.3V regulator and then to NRF24L01+) was connected from the 5V power supply. @numanx - good, then the nodeMCU regulated the voltage to 3.3v internaly if you power it through the USB. Make sure you power the radio with 3.3v as well... the radio cant handle 5v. Use 3V3 from the nodeMCU. This means the radio cant initialize. Either its wrong wired, got the wrong power or its a bad radio. Make sure you wire not to MOSI, etc., but to HMOSI, etc. I've connected the ESP8266 and NRF24L01+ exactly as described in Connecting the Radio(https://www.mysensors.org/build/connect_radio) at the NRF24L01+ & ESP8266 section. Still the same error, I've tried rewiring a couple of times using different wires. Which board did you pick beneath the board manager? Also, what voltage are you supplying the socket adapter with? If you're supplying it with 3.3v, then that may be your problem. Supply it with 5v instead. It has a voltage regulator to reduce the voltage to 3.3v, but if you feed it with 3.3v instead, it maybe isn't producing enough regulated voltage. How about skipping the adapter, at least temporarily to check whether the radio works without it. That would eliminate one possible problem source. I've tried suplying the adapter with 3.3v and also with 5V. Now the radio is connected directly to the ESP8266 but still I have the same error. At this point, it becomes 20 questions unless you post detailed photos of exactly what you've done. Either your hardware is defective or you've made an error that you can't see by yourself. It's not nodemcu, but it is ESP8266. It does the "wiring" for you. And it works. Ok, I've solved the problem with the Wireless SSID and password by uploading the HelloServer sketch from the ESP8266 examples. Now I rewire the ESP8266 and Radio and I will post some photos. Here are the photos of the ESP8266 board, NR24L01+ and the wiring. It's hard to tell from your photos what is wired to what. Suggest you upgrade to the current Arduino IDE and verify that you have the most current NodeMCU board definition installed. Also confirm that you're using the latest release of the Mysensors library. Have you verified that your hardware is working? e.g. try the radio module in a different "known good" platform and see if it runs correctly. On the NodeMCU, try driving something else that has a SPI interface and confirm that it works properly. If all of the above checks out, then I would think the next step would be to use a logic probe to see if you're getting the proper signals sent between your NodeMCU and the nRF24L01 module. If not, maybe you need to add a pull-up or a pull-down resistor on one of the datalines. The logic probe would tell the tale. It seems that I have a problem with the ESP8266. Checked if the wiring is good with a multimeter probe on each pin of the adapter(which I know it worked) and each pin of the radio to verify the correct pinout. It seems that the pinout was ok and the wiring was also ok.
Write a sketch with all the ports from D2 to D8 in output HIGH and with a little buzzer I've tested each pin. It seems that D7 doesn't give voltage. Checked the pinout diagram for the ESP-12E. Checked for continuity between GPIO13(from the chip) and D7 and there was no continuity. Tried to connect the radio MOSI Pin directly to GPIO13 and IT WORKED! Is there any way to move the MOSI pin from the board to another digital pin from ESP8266? It is possible to use software spi instead of hardware spi (hardware spi only works with the default pins). See https://www.mysensors.org/build/ethernet_gateway for how to enable software spi and use #define directives to use different pins. Check the solder connection between the GPIO13 and the pcb. Probably it's faulty. With a little luck probably you can just re-solder the connection manually, and `then you'll be good to go. @numanx oh. Sorry. My bad. Today I've resoldered the ESP8266 Chip. This thread has been a life saver for me. Just wanted to drop a line for anyone else who might be despairing why despite numerous tests, the radio would still not work on the NodeMCU. In my case, it was NodeMCU v3 from Lolin and I had two traces not workingbetween GPIO13 and GPIO12 - there was no continuity of the trace between the ESP-12E chip and the board pins. I had to solder those two traces together and now - everything works! Thank you for inspiring me to look for this problem.